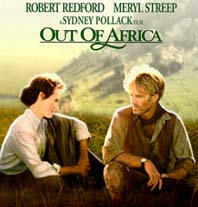 True story of Danish writer (Streep) who arrives in 1913 Africa to run a coffee plantation, who has a love affair with a British adventurer (Redford). Sydney Pollack (who also won the Oscar for direction). With Joseph Thiaka, Michael Kitchen, Susan Hamilton, Rachel Crowden, and Malick Bowens. Sydney Pollack (1934 - ) American director who started in TV, who has many feature credits. His producer credits also include: TOOTSIE for which he received a 1982 nomination.